The ﬁrst non-staining*, odourless, broad spectrum, general insect control product for indoor and outdoor use. 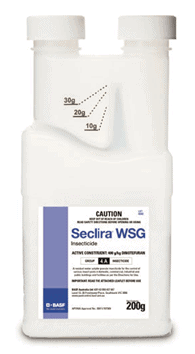 Seclira WSG is a broad spectrum non-repellent insecticide that can be used inside and outside to control a range of pests and is compatible with BASF non-repellent insecticides and baiting products providing PCOs with the most versatile treatment and active ingredient rotation strategy available. The unique WSG formulation dissolves clear and remains in suspension providing the first odourless, non-staining formulation available. Seclira WSG is powered by a novel non-repellent active ingredient developed with BASF Genuine Transfer Effect technology, ensuring superior performance in the most difficult situations. *Seclira WSG will not stain surfaces that water alone does not stain. Dirt on surfaces may result in runoff and staining. Where staining is a concern, a test application is recommended. PreviousPrevious post:HERBICIDE SOLUTIONS FROM PCT Richard MurrayNextNext post:GREENZONE® Termite & Insect Barrier has arrived!